Bring all new flavors to your specialty drink menu with this Torani lavender flavoring syrup! This tempting flavor will complement your beverages without overpowering them or being too sweet, while the user-friendly bottle will be convenient for your busy baristas to use. Torani flavoring syrups are specially formulated to resist curdling in milk and to hold up well under heat, making them the perfect choice for espresso-based drinks, brewed coffee or tea, and more. Use this flavor for frappes, iced coffees, smoothies, and even baking! I bought Torani and Monin to compare to make a new drink with and the Torani was much more flavorful and potent. The color is very nice and the price is better. One of my personal favorites at the cafe I own! We usually add it to Chai lattes or make Honey Lavender lattes. Not overwhelming or artificial tasting in my opinion. 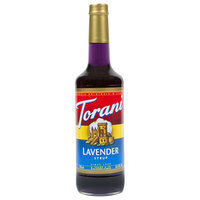 We add this this Torani 750 mL Lavender Flavoring Syrup to our London Fog tea latte drink and it works brilliantly. We recommend this product. We use Torani syrup for many drinks in our establishment. We are excited to add some lavender options to our drink menu because this syrup has an amazing flavor, and is so reasonably priced. All torani syrups are amazing. I bought the lavender to add flavor to our sparkling lemonade over the summer and it was a hit. Lavender was our number one selller! If looking to add different flavors to syrup options at your restaurants, we highly recommend lavender. It's subtle flavor is perfect in lemonade or tea. The customers love the taste. It doesn’t look pretty in our green tea but people still order it and say that it tastes amazing. We have to keep reordering. Thank you for your feedback! We’re sorry you did not prefer this flavor in hot beverages. For recommendations, please contact our Customer Solutions team. We used this syrup primarily for flavoring cocktails and Italian soda. It tastes like a sweet lavender, but doesn't feel artificial or overly cloying. Recommended. Very strong and real flavor. This lavender syrup has been a hit and doesn't have a fake or odd aftertaste. Blends well into coffee and teas, both hot and cold. I love lavender and this is a beautiful tasting syrup, you just need a bit as lavender anyway can be very overpowering, a great addition to my collection! The lavender syrup is very unique and floral in its taste and smell. The syrup is very good in our green tea and is super light in taste. We were inspired by the local coffee shop to introduce honey lavender lattes and decided to try out this syrup. The flavor is very mild which has been well received by customers. I thought I would jump on the trendy bandwagon and try this in drinks and desserts, but I am not a fan. I love lavender scents, but not flavoring syrups. Torani Lavender syrup is amazing in everything especially lemonade. Excellent in tea, cocktails & salad dressings. Love the flavor of lavender. Try it..you might be surprised! I was looking for something different to mix with lemonade and whiskey to balance out the sour. Torani's Lavender was just the ticket I needed to make a delicious drink even better. Love this syrup! We use it for our flavored drinks, which are especially popular in the summertime. Lavender is a less common flavoring to find, so we're happy to have found the one from Torani. This is a flavour that is usually harder to find but webstaurant not only carries it but they have it at a very good price as well! A very nice, light bodied syrup that has a great floral overtone making it a great addition to my organic lemonade. The flavor is so subtle and delicious. So about a year ago I went to this Diner and they had lavender lemonade and for the life of me I didn't know how I was going to recreate it and when I saw lavender on your website it made my heart soar and the minute I got it it was one of the first things I made and your lavender syrup is to die for it was so wonderfully balanced and sweet. This lavender syrup tastes amazing in coffee but beware, if you have never had this you might not like it! I personally love it and the nice floral taste and smell it gives the drinks I've added it to, but a bunch of people that have tried it with me said it tasted and smelled like soap. This is perfect lavender syrup !! it makes amazing tasty. we use this with lavender latte. i ordered Monin lavender syrup, but i think there is no difference between. Torani is more cheaper than monin. so it is more worth!! Lavender is so so hip right now. I can barely keep it in stock! We use this in coffee, lattes, soads and we cook with it too. One of my BEST selling! We use this to make our ice cream and although it lacks the color of lavender, it definitely taste a lot like lavender. This syrup is so good when added to lemonade. It's refreshing and clean and doesn't have a cloying after taste that a lot of syrups tend to have. Great floral taste! We cannot keep this stuff on the shelves! People love this stuff! We are using it in our bubble teas and flavored teas however I've played around and made some shakes with it and it taste great also! I've never seen this in stores, and thought it was a really neat flavor. It isn't as delicious as I expected it to be, but the smell is true to flavor, and is definitely interesting. This is another one you have to add a good amount of to get a strong flavor. I'm not going through it as quickly as some of the other flavors, but I do enjoy it. May or may not buy it again. This flavor syrup is perfect for making Lavender lattes. I have been wanting to try a lavender latte but never came across a cafe that has lavender! Perfect for at home or cafe use. I've used this syrup from cocktails to using it in ice tea, taste is good and the bottle is well made and holds up well. Lavender is my favorite flavor of the moment! I have used it in everything, and Lavender lattes are the best!!! This Torani syrup is delicious in lemonade, iced tea, and makes a fantastic and exotic Italian soda. Easy to use and make delicious drinks. I bought this flavoring for my wedding to mix with an ice tea and lemonade bar and I have had to reorder 4 times and havnt even had my wedding yet. The flavor is impeccable. This is perfect lavender flavor. Very strong flavor, if you're unfamiliar. Makes great ice cream. The color is really dark and intense in the bottle but since the flavor is so concentrated, it becomes much more delicate when using. This lavender flavor is delicious. Not only is it authentic lavender flavor it has a great color. This past mothers day i used it to make a lavender sangria. I have had a few requests for lavendar lattes and tea. I purchased this product and have had all great compliments from it! I will be ordering again. Really good product for lattes. It seems like it woudd not but this products has many uses. We will be buying again soon fir more drink mixes. My customers have been LOVING this flavoring! I have used it in both cupcake batter and frosting. It has been most popular when used with French Macaroons! Not sure how to feel about this syrup. I've used lavender buds before for my baked goods, and I've had some nice French lavender macaroons. So I can tell you it definitely tastes like legit lavender. If you've never had it, it tastes like Fruit Loops. Very floral Fruit Loops. Craziest thing. Torani is almost always right on point when it comes to syrup flavors. They nailed this one too. The only thing is that this syrup is I.N.T.E.N.S.E. Super powerful lavender flavor. We wanted to make a lavender latte and even using one pump lavender and the rest simple syrup was a bit much. This stuff will definitely last you a while. This lavender syrup boosts up the flavor. It adds the strong flavor of lavender and sweetness. I had trouble bringing out the flavor of lavender in a drink, but Torani syrup made a difference. I love Torani's lavender flavoring. It has a legit lavender scent and taste. I use it to mix into my heavy cream to make a lavender white chocolate ganache and it turns out DELICIOUS!!!! It's amazing how prominent this flavor is when we used it in our lavender latte and milk tea. Still trying to find the right balance where it does not taste too overpowering. I do prefer this one slightly more than the Rose flavor. We love almost all the Torani syrups! They pour well, taste good, blend into drinks well, and are DELICIOUS! Put them in tea, coffee, Italian sodas - whatever you like, it doesn't matter, they are great. We wouldn't use any other kind! Lavender is great, we LOVE it in Lemonade. It is also awesome in tea, and in Lavender Lattes. A must try! Syrup arrived quickly and was well-packaged. It's very sweet, and a little goes a long way. Great way to enjoy lavender martinis at home without preparing homemade syrup. Believe it or not this flavor is delicious! I have mixed it with vanilla and with white chocolate and both ways are definitely delicious. The fragrance and lavender hue is also a draw.